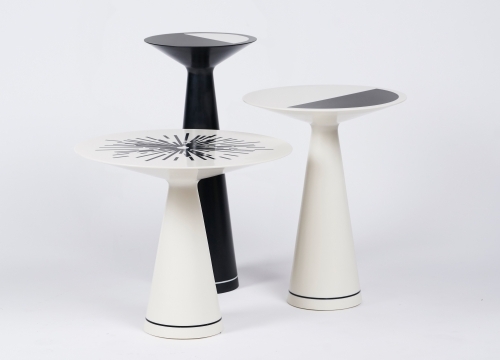 This set of nesting occasional tables, made of a silky smooth, laminated Corian, play with the contrast of night with day, of light with darkness. 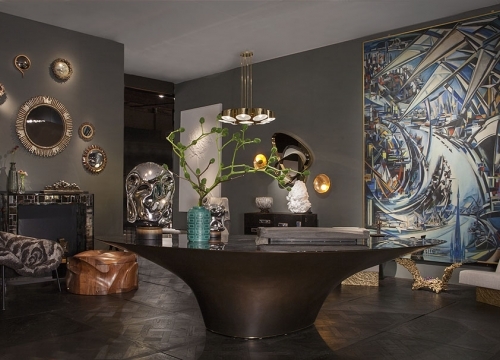 The pieces are entirely black and white and adorned with intricate, laser cut and bronze inlaid designs depicting abstractions of the sun and moon. The table largest in diameter, brightest, and shortest (and thus the farthest from the eye), represents the sun; the other two tables represent the moon, both in its brighter gibbous, and darker crescent, manifestations.